Visitors to the Aquarium of the Pacific’s massive, 29,000-square-foot expansion will get to dive into the ocean and solve its problems while sitting in a theater seat. The expansion, set to open in spring 2019, will include an art gallery, a 4-D theater with a 180-degree curved 32-foot-tall screen, an interactive changing exhibit—double the size of the old one— and a new members lounge, among other features. Rendering of the orientation gallery. Courtesy of the Cortina Productions. 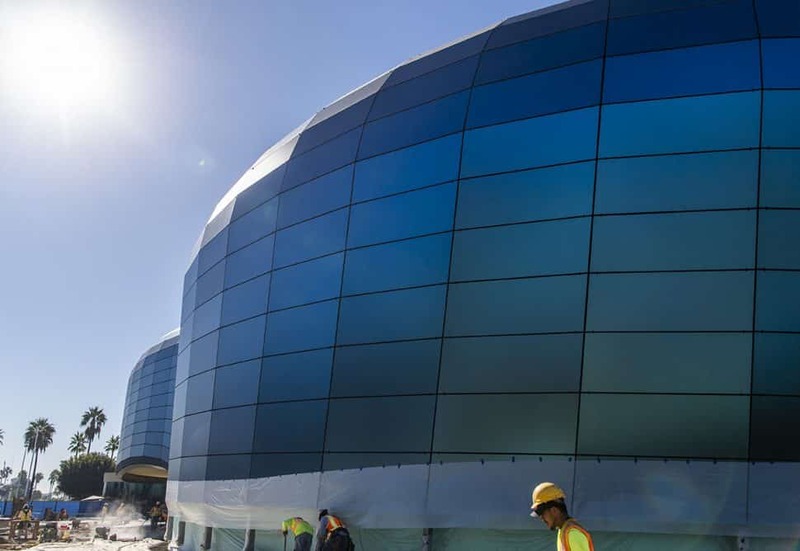 The new wing features smooth blue whale-inspired glass outside that leads visitors into what will become an art gallery and members lounge. The gallery slowly turns into a pre-showing area that starts to envelope the visitor with a projected waterfall and gently sloping floor. 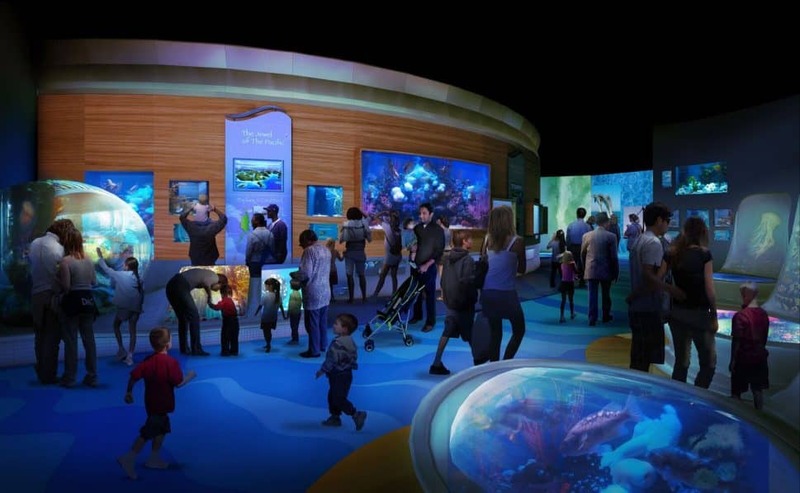 “People will get metaphorically deeper into the sea,” said Claire Atkinson, senior manager of communications for the aquarium. At the bottom of the sloped floor is the entrance to the 300-seat stadium style theater. 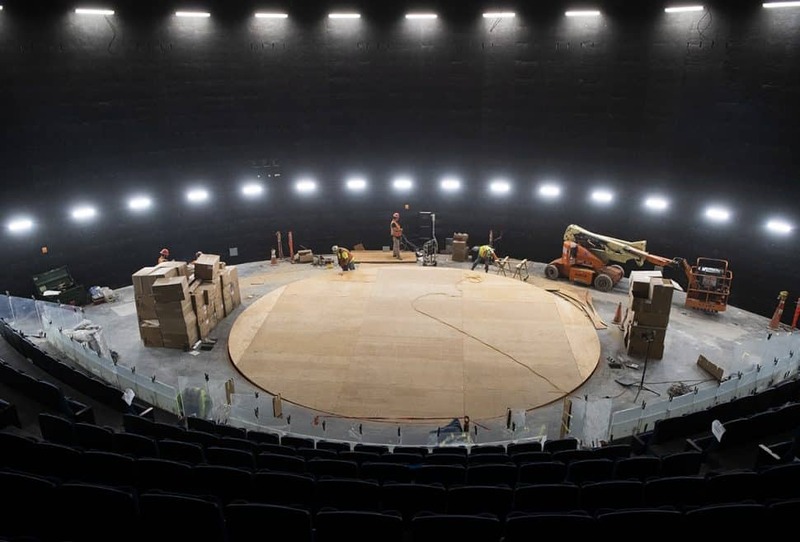 In addition to the curved 130-foot-wide by 32-foot-tall screen, a 30-foot circular platform sits in the middle of the floor. It can serve as a stage for performing arts, but also will tilt 5 feet up to become another screen. The films will be included in the cost of each regular aquarium ticket. 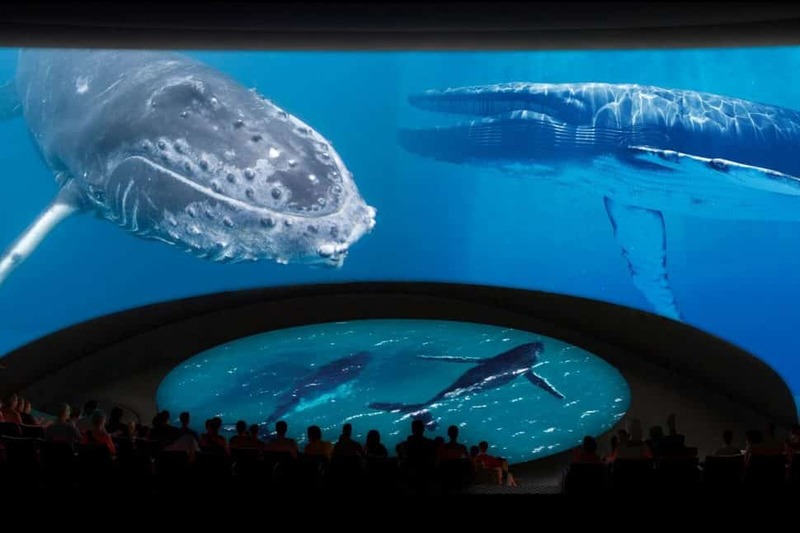 The idea, Atkinson said, is that they can’t always show things like whale migration in the middle of the ocean inside the aquarium, but they can bring immersive videos of that to visitors. 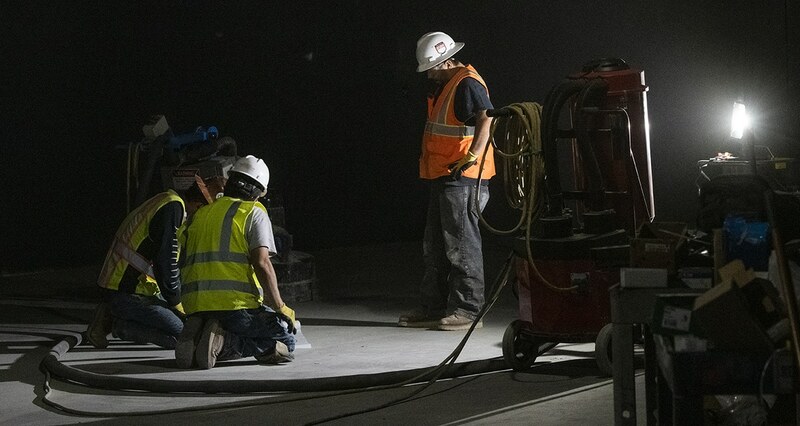 The theater seats will have rumblers, fog and scents to more completely immerse visitors. 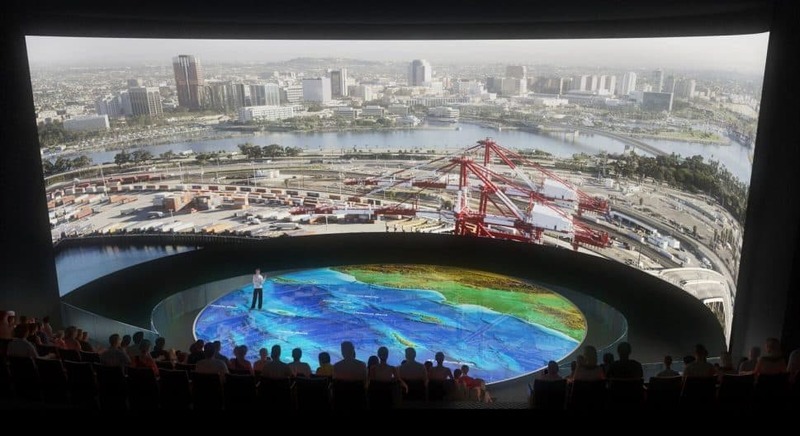 The room can also support regular movies, immersive lectures and panels. After the show, visitors will go upstairs to the new interactive changing exhibit that will tie into what the movie was about. The area will get visitors to think of and experiment with ideas to solve ocean-related issues, Atkinson said. The area will also include some live animals too. 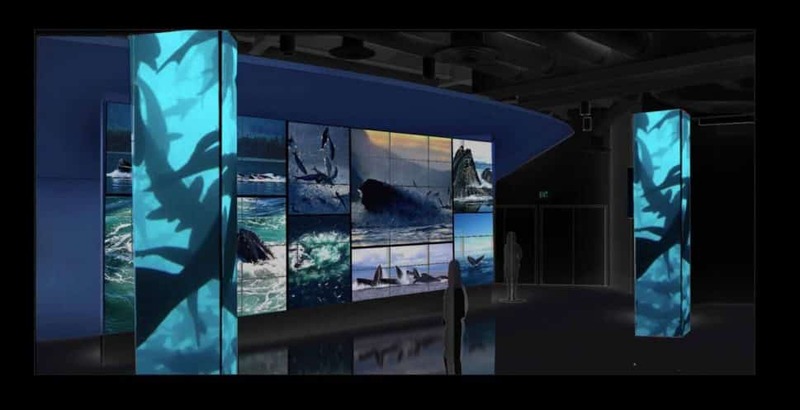 Rendering of the changing exhibit gallery. Courtesy of the Cortina Productions. “It will show people that all life on the planet is tied together,” she said.